Ask and most people will say they like hiking, and they want to do more of it. But when? And where? By the time you find hiking trails in your area, you might find you're out of time to hike! Time constraints affect us all and hiking is like everything else: if you're going to do it, you need to find the time. To help you plan a hike near you, select from the best local hiking trails to suit your interests. 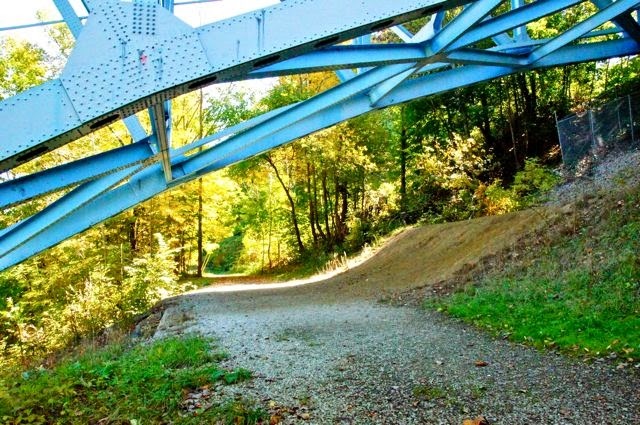 Get started with this list of trail treasures in Greater Cleveland and Northeast Ohio. During the summer months, hit the beach! Fairport Harbor Lakefront Beach Park, a Lake County Metroparks property, has family-friendly appeal thanks to its sandy beach, seasonal canoe/kayak rentals, and food concessions. Hikers can traverse an approximately 1.5 mile loop on a variety of surfaces - some sidewalk, some sand, some dirt trails - almost all of which offers lakefront views. Bonus: visit the Fairport Harbor lighthouse museum, and if your kids like ghost stories, be sure to ask about the cat. Tucked inside Bedford Reservation, not far from the I-271/Forbes exit, hikers can gasp (and take great photos) at Ohio's "grandest canyon." Trail terrain varies, from paved all-purpose trails to mulch-covered bridle paths and quite a few stairs. Gorge Parkway Trail is more than 6 miles long, and hikers are rewarded with views of gorgeous Bridal Veil Falls, but there's good news for less-ambitious hikers: you can park right by Gorge Overlook and enjoy the view just a few steps from your car. The Gorge Overlook at Bedford Reservation can be accessed by most sturdy strollers and some wheelchairs. Every Cleveland family should be required to visit Rocky River Reservation, if only to get a look at the life-size fossil replica of the Terrible Fish, Dunkleosteous, displayed inside the Nature Center. Bonus: a short loop hike around the nature center offers great views of Rocky River, and decent aerobic exercise thanks to a 100-foot climb to the top of the stairs. Rocky River is hard to beat, but for totally different terrain, visit Findley Lake State Park, which boasts 16 miles of rustic trails, including a fair portion of the Buckeye Trail. Like to walk and roll? Mountain bikes are permitted on some trails at the park. Visit Park Place on State Route 303 in Peninsula. Yes, it's a gift shop, but it's more. As the park's newest visitor center, it's full of fun, educational activities. From there you can stroll along the Towpath (up to 40 miles, if your clan has the stamina) or just enjoy walking on the sidewalks through Peninsula's thriving restaurant/shopping district. Both the sidewalks and Towpath are accessible by most wheelchairs and strollers. Just go! Hiking is a fun, free, healthful activity that benefits almost everybody. Cleveland's trails offer points of interest for nature lovers, photographers, history buffs, architecture aficionados, just about everyone. Sure, you can buy expensive hiking boots and other gear, but you don't have to. In Cleveland, you can hike for many enjoyable miles in a pair of sturdy, comfortable shoes. So, go! Take a hike, right here in Cleveland! This article was originally published in 2011 in Yahoo! Voices, a now-defunct channel of the Yahoo.com family of websites and other experiments. Surprisingly, my byline hasn't changed a lot since then. (I'm sure I haven't either.) - - - - - Diane Stresing is a commercial freelance writer and the author of 60 Hikes Within 60 Miles of Cleveland. She admits it's hard to find time for hiking and biking on Cleveland-area trails during her kids' soccer seasons. For the latest trail news and more pictures of Ohio's gorgeous scenery, visit the book's Facebook fan page. What Makes a Good Manager Good? It may be easier to conjure up an image - or a caricature - of a bad manager than it is to identify what makes a manager good. For the sake of this article, let's define good as "effective and admirable." When I think of the best managers I've had, they were people I wanted to work for, people who inspired me to do my best work, and in some cases, I aspired to be just like them. What raw ingredients make the ideal manager? If any single business school had the answer, well, there wouldn't be quite so many business schools. In fact, many great leaders and just plain-old good managers didn't go to business school. Marc Cica, an award-winning manager and former director of sales for a Fortune 50 company, has spent much of his career developing future leaders. Two of the top traits he looks for in an effective manager are "industriousness and alertness." In other words, they're hard workers who can anticipate - and prepare for - change. "There are no short-cuts to success, it is earned by those who work very hard and persevere," Cica says. But if "hard work" was the only thing necessary to become an effective manager, we wouldn't need business schools at all. Truly effective managers not only work hard, they work hard at the right things. Deciding which things are the right things requires strategic thinking; convincing a team to work with you on those 'right things' requires a little bit of talent and a lot of good habits. Here are some of the other raw ingredients, good habits, and skills that many effective managers share. "A leader's energy and enjoyment, drive, and dedication will stimulate and greatly inspire others," says Cica. While too much emotion in the workplace is distracting (see number 2, below) a little bit of excitement about the task at hand is necessary and helps motivate a team. "Control of your organization begins with control of oneself. Set the example of personal discipline and expect everyone in the organization to react to unexpected events or adversity in like manner," Cica tells new managers. When I think about the worst, and least effective, managers I've know over the years, the first thing that I remember about them is how they treated others. When a manager is respectful of customers, co-workers, and subordinates, chances are the whole organization will do the same - and the entire company will benefit. Cica builds team spirit on the basketball court (he coaches, too) as well as in the office. Why? Because it's vital to any group of people that work together. Everyone on a team must understand that "the 'star' of the organization is the organization itself, and not any one individual," Cica says. Abraham Lincoln said, "I do not think much of a man who does not know more today than he did yesterday." Lincoln didn't go to business school, but his instincts were pretty good. Effective managers must learn constantly and prepare their teams to meet new challenges. Cica believes the best leaders are "life-long learners who create organizations that foster and inspire learning and continuous self-improvement." If you have some of these basic traits, are willing to put them in action every day, and can convince others to work with you rather than focus only on their individual goals, you'll earn the right to be called a good manager. This article was originally published in 2011 in Yahoo! Voices, a now-defunct channel of the Yahoo.com family of websites and other experiments. Surprisingly, my byline hasn't changed a lot since then. (I'm sure I haven't either.) I'm still a business copywriter focusing on Ohio's people and places, and my byline still appears regionally, nationally, and in Northeast Ohio - of all places. Senator John Walsh has a lot to be proud of - every veteran does. But being an arrogant fool about plagiarising more than 25% of his thesis paper isn't one of them. Integrity, anyone? I mean, geez, I know plagiarizing is popular with pols (and others) but sometimes, people get fired for that kind of stuff - even in Russia. This is personal. 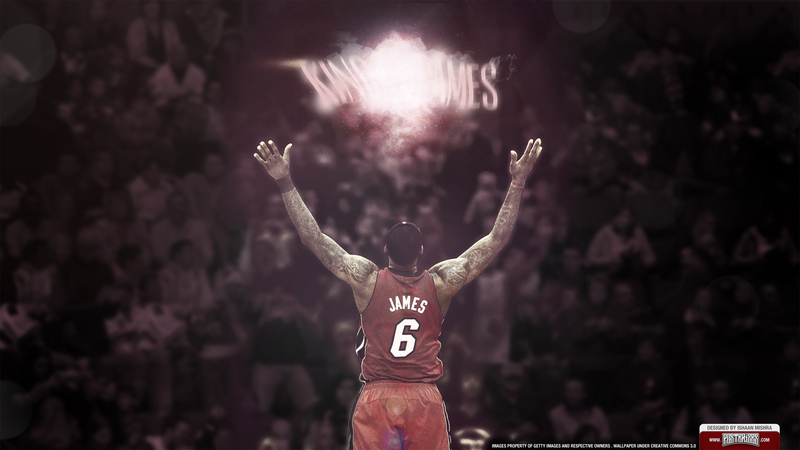 It's my response to a letter LeBron wrote to me. OK, he didn't really address it and lick the envelop himself. Of course I'm referring to the "letter" he dictated to Sports Illustrated's Lee Jenkins. His words won me over. And I wasn't exactly rolling out the red carpet last week, or anytime, since his rather overblown decision a few years back. While Cleveland columnists spent oodles of time last week screaming "COME HOME, ALL IS FORGIVEN" I tweeted twice about the dude's contract options and made a rather concerted effort not to care because, hey, why should I? I'll never meet the guy, let alone know him, and in 10 years they'll be another "King." Insert eye-roll here. I'm just not into celebrities, and don't get me started on the absurdity that is pay scale in professional sports. "I feel my calling here goes above basketball. I have a responsibility to lead, in more ways than one, and I take that very seriously." I believe words can make a difference, like you apparently believe gestures can. 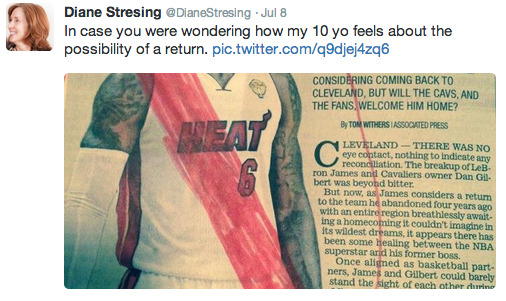 So, OK: You show little boys and girls in NE Ohio that "making it big" doesn't necessarily mean leaving town. I'll be hoping you live up to those - and other- promising words in your letter. A championship, plus a little respect for my adopted hometown, would be a terrific bonus. PS: I hope you'll be #23 again. My son kept his jersey, and he's almost grown into it. So let's do this! Words can manipulate. It's up to readers to think, harder than ever, about the written (or at least typed and disseminated) word. Two examples - quite worthy of consideration together, methinks - are Truth Goggles, another annotation tool for journalists, which Poynter breaks down nicely, and (yet) another little experiment by Facebook. Please writers, write well. Honestly, even. And people everywhere - please, read thoughtfully. The Truth Googles launching today is a tool to enable anyone to annotate an existing piece of online content to raise and answer questions about what's been reported/written. It can also offer a layer of personalized commentary. Whether Truth Goggles is a tool or yet another shade of social media apps, I'm not sure. I'll keep watching, reading, and thinking - and hoping you do, too.